The Gîtes of La Filature are nestled in the typical Cévenol village of l’Estréchure, in the heart of the beautiful, wild and preserved environment of the Cévennes National Park. 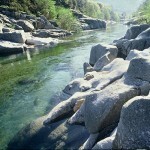 In June 2011 the Cévennes National Park was registered as a UNESCO World Heritage Site for its cultural landscape formed over millenia by man’s practice of agro-pastoralism. Lovers of nature and outstanding landscapes will be delighted by the chestnut groves, coniferous and oak forests layering the landscape. Crossed and ravined by babbling brooks with gushing rivers forming deep valleys, the landscape is both luminous and deeply shadowed at the same time. The Park is renowned for its unspoilt habitats, flora and fauna. 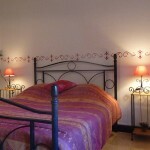 At the Gîtes of La Filature you are promised a holiday where you will benefit from the warmth and laid back atmosphere of the South of France. Due to its position in the heart of the Cévennes, you will enjoy the sunny climate but with tolerable mountain summer temperatures: a perfect restorative setting for relaxation. The four gîtes that make up La Filature offer an ideal destination for those who wish to holiday with family or friends and to discover a dynamic region with remarkable rural heritage. Our ambition: to offer you, no matter what the season, a relaxing and fascinating holiday with the opportunity to explore a range of recreational activities. Come and relax in this imposing house with a rich past, composed of 4 gîtes (spacious apartments of 68 – 88 m²) for between 4 and 6/8 people which are both comfortable and independent. Enjoy the beautiful swimming pool and sunbathing area, furnished for your comfort and relaxation. Numerous sun loungers are at your disposal so you can make the most of the fabulous Mediterranean climate. The swimming pool is not chlorinated: we use a salt system for water hygiene which does not irritate the eyes nor stain your swimming costume as chlorine may. In summer the children will be able to enjoy playing with various inflatable toys. Armbands are available for your little ones to use and if you like, you can bring your own water games. 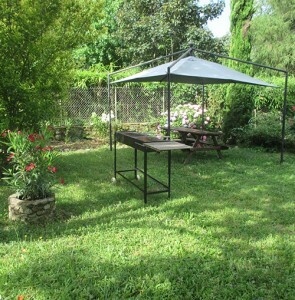 The garden of La Filature is a charming little corner for rest and relaxation where holidaymakers love to hang out in the daytime and share fun moments in the evening around the barbecues. The garden is perfect for relaxing and rediscovering oneself and enjoying the « joie de vivre » of the South of France! All our guests love this spacious area equipped with pool, table football and ping pong. We are dedicated to your amusement and relaxation. You can take the opportunity to sit around a table and share a game of cards or play board games! Everything is provided for you to make the most of your activity time. 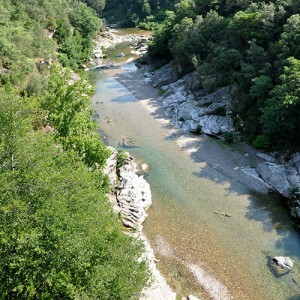 There is a beautiful bathing area only a short walk away from La Filature, in the Gardon River, offering idyllic spots where crystal clear water cascades down the rocky riverbed. Nearby you can enjoy canoeing/kayaking, canyoning and if you are lucky spot the local beavers who live here. A bakery/general store where you can buy Nathaniel’s famous almond tuile biscuits. A restaurant-bar open at lunch and dinner time, in the summer season and in the evening every weekend (off-season). The « Auberge » serves locally inspired cuisine at a very affordable price or you can stop off to share a beer or wine in their vine covered trellised garden. A post office open every morning weekdays. A painter who has a studio in the village and offers remarkable studies of the Cévennes.